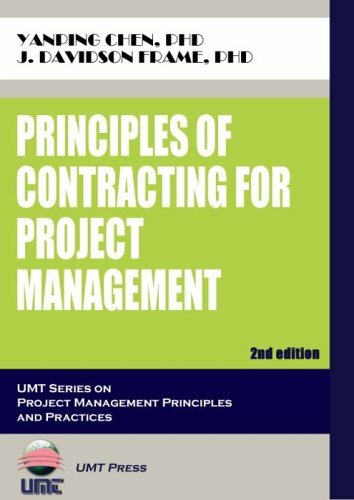 Principles of Contracting for Project Management, 2nd edition, contains the basic information project professionals need to get up to speed on contracting fundamentals. Today, substantial portions of project work are outsourced. Project supplies are often purchased by means of contracts. Larger projects make heavy use of subcontractors. In this environment, it is important that people engaged in project work understand the contracting principles that guide their efforts. The second edition updates and expands the material contained in the first edition. Of particular note is the inclusion of a new chapter on performance based contracting, which is rapidly becoming the dominant way project work is contracted. Chapters contained in the 2nd edition include: Chapter 1. Introduction; Chapter 2. Procurement Planning; Chapter 3. Solicitation Planning; Chapter 4. Preparing the Bid; Chapter 5. Source Selection/Contract Award; Chapter 6. Post Contract Award/Contract Administration; Chapter 7. Contract Close Out; Chapter 8. Odds and Ends; Chapter 9. Performance Based Contracting; and Chapter 10. Conclusion. This book is compliant with the Guide to the Project Management Body of Knowledge (PMBOK), and is an excellent study tool for people preparing for the PMP certification examination.